American Vetch is a member of the Pea Family. It is a slender climbing plant which clings to other vegetation by slender coiling tendrils at the end of each leaf. It grows to 4 feet in height and has green, compound leaflets which grow on opposite sides of the stem in pairs of 8-12 each to 1.5 inches in length. It grows in open or disturbed areas such as along roadsides, fields and in pastures. American Vetch is found throughout much of the US and Canada. 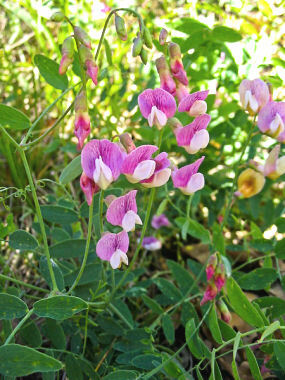 American Vetch blooms between May - July and produces loose clusters of 3-10 deep pinkish-purple to reddish-lavender, pea-like flowers to 1.25 inches in length. 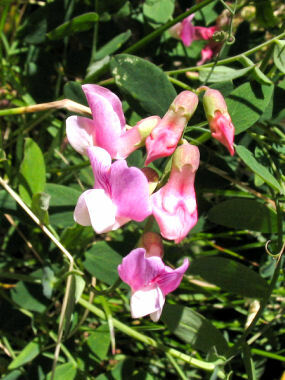 Flowers are followed by a pea pod to 1 inch in length containing 8-14 round seeds.